Eve Graham and her husband Harry have applied to an adoption agency in hopes to grow their family, but first they’ve got to pass the rigorous inspection process. The head of the agency, Mr. Jordan, sees immediately that Eve would be a great mother, but he’s not so sure about her husband. He can tell that Harry’s keeping a secret and makes a point to put extra legwork into the investigation to find out just what that secret is. The adoption agent, after interviewing all of Harry’s former employers and co-workers and checking out his desk at work, finds out that Harry has been traveling from his home in San Francisco to Los Angeles frequently. He also discovers that Harry’s full name is actually “Harrison Sinclair,” and that this name is attached to a home in Los Angeles. Following these leads, Mr. Jordan discovers a shocking truth: Harry has a second wife and child there. Ida Lupino directs The Bigamist a 1953 drama in which she also co-stars alongside Joan Fontaine (Eve), Edmund Gwenn (Mr. Jordan) and Edmond O’Brien (Harry). The screenplay was written by Collier Young from a story by Larry Marcus and Lou Schor. 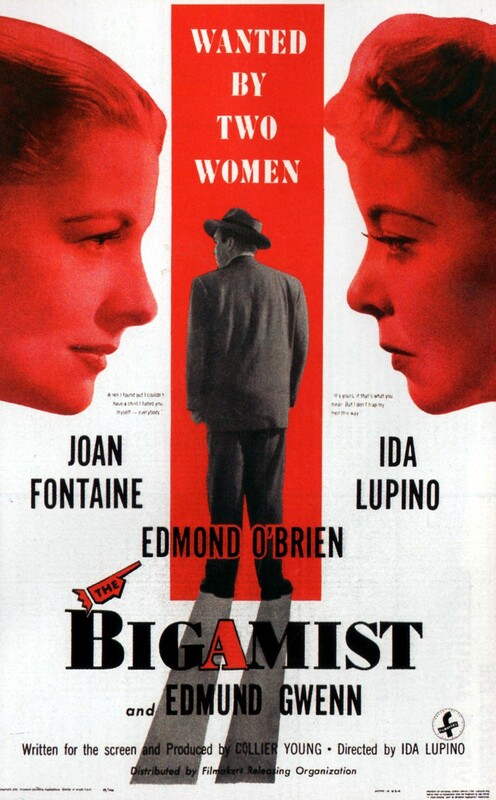 At its core, The Bigamist is a romantic drama, but Ida Lupino’s fantastic direction gives it an air of mystery as well. At times, as Harry is narrating flashbacks that detail just how he came to be married to two women, the film even has a noir-ish edge which grips the viewer and keeps the film interesting. The performances in this film are really great as well. Perhaps this is because, in some ways, this piece of art seems to be imitating the lives of some of its stars. Ida Lupino was married to Collier Young, who wrote this film, from 1948 to 1951. After they divorced, Young married Joan Fontaine in 1952. Young and Fontaine remained married for nearly ten years. Fontaine and Lupino play the two wives of Harry in this film, though on-screen, Fontaine is Wife #1. Edmond O’Brien’s performance is one of the strongest assets of the film. In his scenes with Joan Fontaine, his eyes show the rejection that Harry feels from his wife treating their marriage like a business transaction. Though I don’t sympathize with anyone who cheats on a spouse or significant other, the film does make it easy to see Harry’s motivations in striking up a too-close friendship with Ida’s character of Phyllis. Still, in Eve’s defense, her attitude toward her husband stemmed from the stress of finding out that she couldn’t have kids, which makes Harry’s actions even more inexcusable. He should have supported her rather than starting a relationship with another woman. And if he wanted a divorce, he should have manned up and had a discussion with her about it. 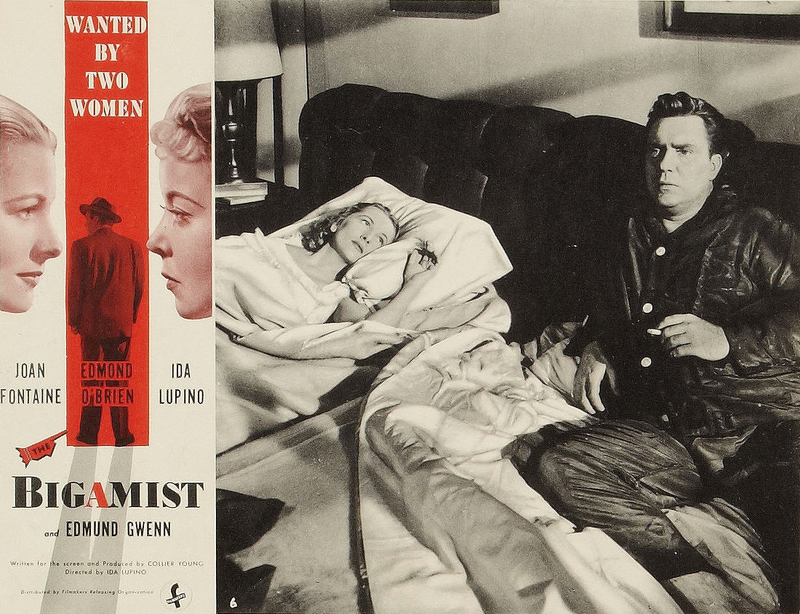 Interesting subject matter for the 1950s…I knew Ida acted in a bunch of noir films, and directed a great one called ‘The Hitch-Hiker’, but I’d never heard of ‘The Bigamist’ until reading your review. I’ll have to check it out, especially if it has somewhat of a noir look and feel to it. Thanks Lindsey! Ida is one of my favorite people. She directed a lot of interesting films that were ahead of their time in subject matter (not to mention, she gave wonderful performances in all of those noir films you mentioned). Hope you enjoy this one when you get around to watching it. It shouldn’t be too hard to find since it’s in the PD! Speaking of the PD — if you’re still interested in more two-person blogathons, I think this week would be a good time for us to troll archive.org for film options, since I’ve got spring break next week and will have time to get ahead on my viewing! Hey, that sounds like a cool deal (the two-person blogathon I mean, not Ida Lupino. Who still was cool). Is there a particular genre you’re interested in trolling for? I guess we’re looking for something cheese-laden, right? Definitely something cheese-laden. Sci-fi and horror are usually the safest bets for that, though if you can find cheese of other genres too, go for it! I’ll take a peek today at Internet Archive and make a short list…if you look too, we’ll see if any of our choices match up! And yeah, horror or sci-fi sounds great…is there a sequel to ‘Invasion of the Star Creatures’? Unfortunately there isn’t. The screenwriter must have been so exhausted after writing the masterpiece that is ‘Star Creatures’ that he couldn’t muster up enough strength to write a sequel. That poor, tortured, brilliant soul! Well, you got two of the three adjectives right!